Design, Print & Packaging Skillnet | Training for you! Providing training to the design, print and packaging industries. The Design, Print and Packaging Skillnet is a training network which works with design, print, signage, label, packaging companies to deliver training solutions which will improve business performance. Building on the work of the Design Ireland Skillnet and the Print and Packaging Skillnet, this network continues to provide excellence in training and networking opportunities to our members for over 10 years. The DPP Skillnet works with proven training and support leaders and tutors to organise and facilitate training events and workshops designed to impart industry-relevant skills and qualifications that will give you and your company a competitive edge in a rapidly moving marketplace. 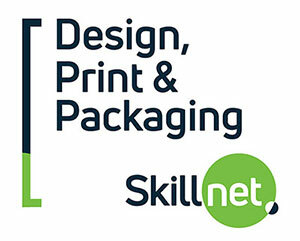 The focus of the Design, Print and Packaging Skillnet is to provide print training, design courses and packaging courses which will assist members to reduce costs and increase competitiveness through enhanced skills and expertise. All of the training provided is in response to the expressed needs of companies in our industry. We aim to improve the strategic capability of our member companies and therefore improve our industry. The DPPS is supported by Skillnet Ireland. Members can access our range of subsidised programmes and influence what programmes are provided. We are affiliated with several national organisations to improve networking among members and the wider community. Boost your performance and corner your market with training in a wide range of design and print disiplines. Ensure your company has the skillsets required to meet the demands of the market today and in the future. Demonstrate your proficiency and reliablilty to your clients and earn their repeat business. See real results when you invest in your professional skills. When your employees know you are committed to maintaining their skills they will operate like a well-oiled machine.